Among things with soul, find me. 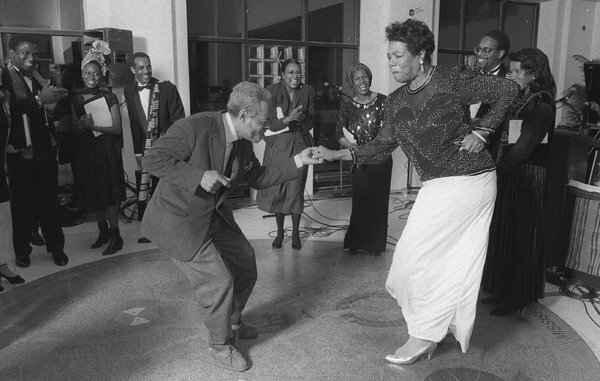 Amiri Baraka and Maya Angelou dancing at the Schomburg Center for Research in Black Culture. Baraka Papers at Columbia University. Baraka Papers at Howard University. Baraka Papers at Syracuse University. Imamu Baraka Papers, 1958-1966, UCLA. Komozi Woodard Amiri Baraka Collection at the Auburn Avenue Research Library on African American Culture and History, Atlanta-Fulton Public Library System. Komozi Woodard Amiri Baraka Collection at the Library of Congress. Papers of Amiri Baraka, College of Wooster. “Amiri Baraka Sessions,” Chester Fritz Library, University of North Dakota (1978). Whitney Strub, “Recovering The New-Ark: Amiri Baraka’s Lost Chronicle of Black Power in Newark, 1968,” Bright Lights Film Journal (4/17/2014). “‘The New-Ark’ by Amiri Baraka,” Harvard Film Archive (1/14/2014).